Affiliated friendly societies came up with several methods of enlisting members and keeping them. 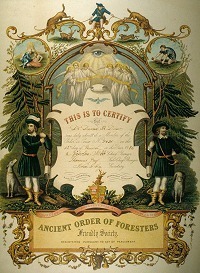 First there was a powerful name: the Oddfellows, the Foresters, or the Shepherds. This immediately planted a picture in the minds of the public. Then there was a mythology. This gave the organisation a 'long' history: giving a sense of security to the newcomer. Then there was an initiation based on the mythology. Every new member had to participate. Initiation had two aims. To bond the newcomer to his lodge and to reinforce the serious intention behind the society: everyone's mutual benefit. Finally, there was their public face. 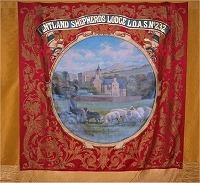 Before feasts, meetings, funerals and more joyful celebrations members of a lodge marched through the streets. This was a public show of fraternity and strength. They wore regalia to set themselves apart. Sometimes, a member would wear full costume to enact a character from their mythology. Very quickly, most societies realised the 'pulling power' of a giant marching banner, which all would follow. By the end of the 19th century these were almost essential parts of lodge equipment, a source of pride and a means of celebrating the brotherhood of the lodge. A lot of regalia survives in museum collections or is gathering dust in family attics. It is usually quite straightforward to identify a society that once used an article. A lot of rules, regulations, accounts and financial statements survive. These help to show the practical functions of a lodge. However, the rituals of initiation and other esoteric practices (like phrases used in meetings, blessings at meals, toasts, funeral practices and lots of others) as used by different societies are difficult to unravel and interpret. It is in the nature of these affairs that this material was passed by word of mouth, from initiate to initiate. If the details are difficult to find, then at least a general outline can be attempted. First, there were passwords and procedures designed to allow only initiates into the lodge when it met in session. Second, there was at least one initiation ceremony. The prepared initiate was usually conducted blindfold through the 'wards'. He would be subject to a series of experiences, usually designed to be strange or frightening, perhaps with blows, perhaps with glimpses of objects or images of significance to the society. Each involved a formal exchange of questions and answers (that had been drilled into the candidate beforehand). Each society had their own variation on these ceremonies. Some might have more than one, for different levels or 'degrees'. The reasons for these complicated ceremonies are obscure. The Oddfellows liked to suggest that because they had been 'illegal' they needed to be 'secure', perhaps a memory of anti-combination laws of the18th century. The simplest explanation is that initiation gave all the membersa shared experience. Finally, the parallels with freemasonry are obvious. They probably arose by imitation, when freemason members brought the 'proper' way of dong things with them into friendly societies. They may even have been a memory from the practices of trades incorporations and societies.